"With over 30 years’ experience in a variety of senior management roles, I have developed significant experience in environmental, economic and regulatory policy including project managing major projects and initiatives. I have successfully delivered high profile projects for the Scottish Government on environmental noise, contaminated land and climate change. 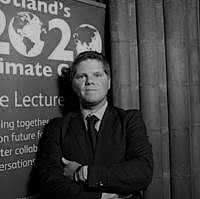 More recently, I served a four-year secondment as Project Director for Scotland's 2020 Climate Group and played an instrumental role in setting the group up. Scotland’s towns have a major role to play in the overall economic success of our nation. SEPA is driving a comprehensive agenda that would see Scotland leading the world in delivering social, economic and environmental prosperity and works with a range of partners including the STP to support initiatives for success across the nation. The success of a town will not come via appropriate and sensible regulation alone which is why strong collaborative leadership is key to success".